The northern end of Barcombe parish extends into the Weald and in view of the distance from the parish church, in 1838 a plot for a church there was donated and over £520 was collected (1 p179). It was to be a long time before the intention was realised, because of major clashes between the local landowners and the rector of Barcombe (see 1 for details). In 1841 W Moseley designed a church for ‘North Barcombe’ (ICBS), on the intended site, and in 1858-68 there were further efforts, which may have included the start of building work, at least on a residence for a priest. An ambiguous mention in Kelly’s Directory of 1878 of ‘extension and completion’ may support this supposition. However, the matter was caught up in wider disagreements about the provision of churches for the parish as a whole (see under Barcombe), so no church was built until 1879-80 (ESRO Par 235/4/1/1-5). The site given in 1838 was used (1) and the architect was H Card (BE(E) p99). The main benefactors were the Shenstone family of Sutton Hall and off the chancel is their pew, as an inscription records. This is a late example of such an arrangement. 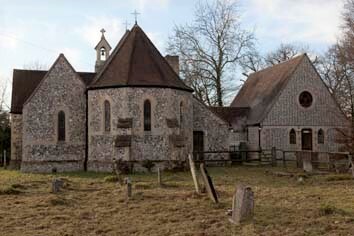 The church is built of flint with a masonry west bellcote, a north aisle and an apse. The windows are either lancets or have simple plate tracery and the arcade and chancel arch have elaborate foliage capitals, whilst the latter also has shafts. This work contrasts with the anachronistic hammerbeam roof of the nave. Most fittings are plain, later C19. The church was probably always lightly used, although the churchyard is quite full and contains a large but anonymous family mausoleum. In the late 1970s the church was still lit by oil lamps and there were efforts to close it at this time, but this did not happen until 1994 (ESRO Par 517). It is now a diocesan youth centre called St Bartz! 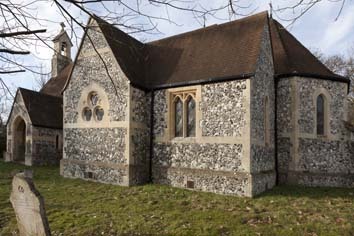 (1) and a large extension has been added on the north side by J Weeks (as ‘Weekes’) (BE(E) ibid), which uses the same materials as the church. Glass: (South nave) J Powell and Sons, 1879, quarries containing monograms (Order book).